The film of fluoride resin coating repels water and oil strongly and prevents diffusion and attachment of oil or water. This is useful for various objects. 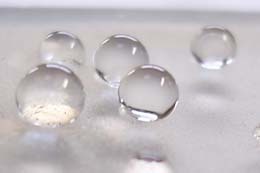 Fluoride resin film formed on the surface repels water and oil strongly. It constitutes a barrier against grease (prevents its bleeding), prevents water and oil from diffusing or attaching and protects surfaces from fouling. The fluoride resin film provides diversified merits. Many choices are available for FLUOROSURF to meet your purposes. Click name of required type to view detailed description. ■Just coat the agent to acquire strong water/oil repellent properties. Soaking or bleeding of liquid or fouling can be prevented by the functional coating. ■Non-flammable, low-toxicity solvent can be safely handled. This is not subject to the Fire Defense Law, Industrial Safety and Health Law and PRTR Law. ■The agent dries at room temperature. You may select the drying time between 5 seconds and 30 minutes. ■Mounted components or plastic parts are not affected. ■Film thickness can be adjusted depending on the purpose. You may select resin concentration. ■You may select non-flammable solvent according to your purposes (contact us for details). A diversity of products may be offered to meet any requirements.Please inquire of us about details. Our products are chemical products for　industrial use. They may have an influence on the health depending on handling manner. For this reason, our products or their samples are not offered for personal use. We would like you to accept such our intention..
■The agent can be diluted to about 10 to 20 times with water or ethyl alcohol when using. ■Film thickness can be adjusted by changing the dilution ratio. ■The agent dries at ambient temperature, forms water and oil repellent film of fluorine resin and repels water and oil. This film may not soluble to water. ■Antifouling function and bleeding grease/resin blocking function can be obtained. ■The agent can be easily coated by dipping or using a brush. ■As the resin concentration can be selected, film thickness can be adjusted according to purposes. ■No surfactant is used and environmental contamination needs not be worried. ■Resin concentration can be changed to obtain film thickness you require. Raw material of water proof spray for cloths, shoes. ■Super water repellent coat of water-contact angle 160°, oil contact angle 90°, and water falling angle 2° can be easily obtained. ■Film is white turbidity film which forms surface of “lotus leaf structure”. 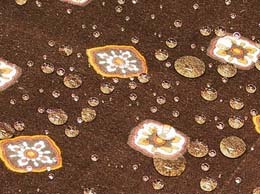 ■Coating sample board is provided as a sample of this product.